An antiproton (symbol p, pronounced p-bar) is the antiparticle of the proton. An antiproton is relatively stable, but it is typically short-lived because any collision with a proton will cause both particles to be annihilated in a burst of energy. It was discovered in 1955 by University of California, Berkeley physicists Emilio Segrè and Owen Chamberlain, for which they were awarded the 1959 Nobel Prize in Physics. At CERN in Geneva, Switzerland, and Fermilab in Batavia, Illinois, antiprotons are routinely produced and used for scientific research. 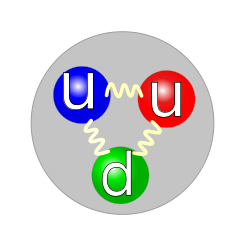 Theoretically, an antiproton consists of two anti-up quarks and one anti-down quark, symbolized as uud. The properties of the antiproton are predicted by CPT symmetry to be exactly related to those of the proton. In particular, CPT symmetry predicts the mass and lifetime of the antiproton to be the same as those of the proton, and the electric charge and magnetic moment of the antiproton to be opposite in sign and equal in magnitude to those of the proton. In mid-June 2006, scientists at CERN (the European Organization for Nuclear Research, or, in French, Organisation Européenne pour la Recherche Nucléaire) succeeded in determining the mass of the antiproton, which they measured at 1,836.153674(5) times more massive than an electron. This is exactly the same as the mass of a "regular" proton, as predicted. The formation of antimatter is related to questions about what happened around the time of the Big Bang, and why such a small amount of antimatter remains in our Solar System today. The formation of antiprotons requires energy equivalent to a temperature of ten trillion K (1013 K), which is not attained under most natural conditions. However, at CERN (the European Organization for Nuclear Research, or, in French, Organisation Européenne pour la Recherche Nucléaire), protons are accelerated in the Proton Synchrotron (PS) to an energy of 26 GeV, and then smashed into an iridium rod. The protons bounce off the iridium nuclei with enough energy for matter to be created. A range of particles and antiparticles are formed, and the antiprotons are separated off using magnets in vacuum. The secondary antiprotons (p) then propagate through the galaxy, confined by the galactic magnetic fields. Their energy spectrum is modified by collisions with other atoms in the interstellar medium, and antiprotons can also be lost by "leaking out" of the galaxy. BESS: balloon-borne experiment, flown in 1993, 1995, and 1997. CAPRICE: balloon-borne experiment, flown in 1994. HEAT: balloon-borne experiment, flown in 2000. AMS: space-based experiment, prototype flown on the space shuttle in 1998, intended for the International Space Station but not yet launched. PAMELA: satellite experiment to detect cosmic rays and antimatter from space, launched in June 2006. Antiprotons are routinely produced at Fermilab for collider physics operations in the Tevatron, where they are collided with protons. The use of antiprotons allows for a higher average energy of collisions between quarks and antiquarks than would be possible in proton-proton collisions. The theoretical basis for this is that the valence quarks in the proton and the valence antiquarks in the antiproton tend to carry the largest fraction of the proton or antiproton's momentum. ↑ CPT symmetry is a fundamental symmetry of physical laws under transformations that involve the inversions of electric charge, parity, and time simultaneously. CPT symmetry is a basic consequence of quantum field theory and no violations of it have been detected. ↑ Dallas C. Kennedy (2000), Cosmic Ray Antiprotons Astrophysics. (doi=10.1117/12.253971). Retrieved October 9, 2008. ↑ C. Caso, et al. (Particle Data Group) (1998), B± Eur. Phys. J. C3:613. Retrieved October 9, 2008. ↑ Cosmic AntiParticle Ring Imaging Cherenkov Experiment (CAPRICE) Retrieved October 9, 2008. All links retrieved April 6, 2016. Introduction to the Antiproton Decelerator CERN. This page was last modified on 6 April 2016, at 19:38.